Saksak, is what this unusual dessert is called in Papua New Guinea. Sago pearls turn translucent with banana pieces while steamed in banana leaf. Sago pearls are similar to tapioca pearls and if you can’t find sago pearls you can certainly substitute tapioca. It has an almost jelly like texture when it is cooked and makes for a delicious bite when drenched in a bit of coconut milk. 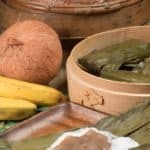 One trick that I learned while researching this recipe was how you can soften a banana leaf by simply running it over a flame. It turns it bright green and makes it easy to fold these little morsels into the packets with out the banana leaf cracking. The recipe for saksak is really simple to make. I used my steamer basket to steam the dumplings and they came out great. You just cook the saksak until translucent. This recipe is not too sweet but made a lovely end to our Papua New Guinean meal. Sago is very popular in the cuisine there, especially in the lowland areas. Sago is actually a starch that is extracted from the spongy center or pit of various tropical palm stems. It is high is calories but has many nutritional benefits. This dish called saksak is made with sago pearls and bananas. It is easy to make and made for a perfect ending to our Papua New Guinean meal. put the 2 cups of sago pearls (or tapioca pearls) into a bowl. Cover with water and then using your hand drain the water. This will leave a little bit of water in the bottom of the bowl. Add in the bananas and sugar. Mix all together. run the banana leaf squares over a flame until it turns bright green, this helps it from cracking or breaking while making the dumpling packets. Put about 1/4 cup of the mixture into the banana leaf and fold up like a package. Continue until the mixture is all used up. In a large pot fill with water and bring to a boil, place the packets in a steamer basket above the boiling water and cover. Cook for about 20 minutes or until the dumplings are translucent. Once cooked place the dumplings in the refrigerator to cool. When ready to serve, warm up the coconut milk on the stove and serve the dumplings with the warm coconut milk. 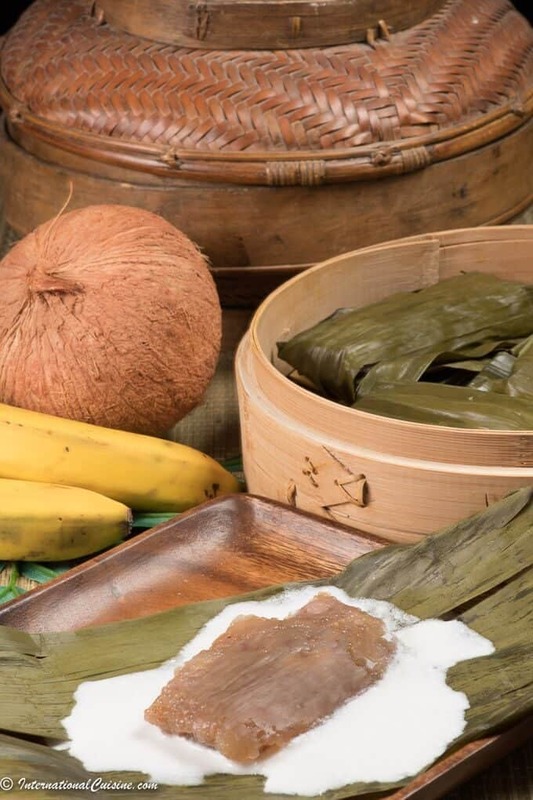 Please note: the banana leaves are NOT edible, they are just used as a vessel to cook the dumplings.